BEIRUT: Drone attacks on an air base in Syria used by Damascus ally Russia have increased since last month but all were shot down, a monitor said on Friday. “Drone attacks against Hmeimim have increased” since July, the Syrian Observatory for Human Rights said, referring to Russia’s main military base in the war-torn country, where it intervened on the regime’s side in 2015 to help fight the armed opposition. The Britain-based Observatory reported 13 assaults in July and five this month, out of a total of 23 since the start of the year. In such attacks, small unmanned aircraft have been loaded with explosives. But “most of the drones are downed by Russian or Syrian air defenses before reaching their target,” Observatory head Rami Abdel Rahman told AFP. The others were also downed. Hmeimim lies just west of opposition-held territory in the northwestern province of Idlib, which President Bashar Assad has said he intends to bring back under his control. The attackers “are sending a message to Russia that they are able to directly target the main center for Russian forces in Syria,” Abdel Rahman said. On Thursday, Russian Foreign Ministry spokeswoman Maria Zakharova blamed “terrorists” for the attacks. “The drone attacks they have launched have become regular in Hmeimim. Our air defenses have downed 45 of them,” she said. Earlier this month, Russian army spokesman Gen. Igor Konachenkov also reported a spike in these attempts in July. “Last month, we observed an increase in attempted drone attacks” against Hmeimim, he said on Aug. 16. 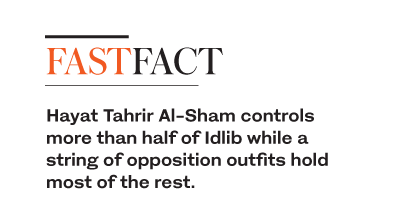 Hayat Tahrir Al-Sham controls more than half of Idlib while a string of opposition outfits hold most of the rest. Analysts say Russia-backed regime forces will likely only target a small part of Idlib with any upcoming military campaign, around the town of Jisr Al-Shughur.